← Which blade for different conditions? I’ve been blessed with so many friends that have invited me to fish with them. Some of those invites have been to go ice-fishing. But this Florida native has always replied “Thank you but doesn’t ice go in your tea?” But my curiosity about the tactics, conditions and feeding response of those icy-fish had won. Besides, how often does an angler get to go fishing with PWT Champ, Mark Martin? So I booked my flight to Bay City, MI. Mark Martin’s Ice Fishing Vacation School entails an afternoon of seminars with the pros at Linwood Beach Marina and a trip to Frank’s Great Outdoors. Then you fish two and half days, with on the ice training. The camp includes a bag of tackle samples too. I spent day one visiting with the anglers and pros; learning the techniques employed on the ice and shooting photos of them with their fish. I got to fish a few hours with nary a bump. But after listening to David Rose’s wit and wisdom, my head was full of ideas and my sides were splitting. I look forward to fishing with this acclaimed, Northern Michigan guide soon. My biggest surprise was how warm I was, layered up inside the Snosuit. I shed the top and my cap by nine o’clock that morning! Day two’s mega bite of 300 fish made the snow storm just a minor inconvenience. But I missed it. Something akin to “Montezuma’s revenge” had a hold on me and I spent the day in my hotel room, on the porcelain fishing chair. While I was disappointed, I was happy for the anglers that attended. They learned a lot about ice fishing and caught a pile of Walleye, Whitefish and even some Smallies. I didn’t get to fish much myself. But I was able to bag some good photos and see how our products are used on the ice. It was a pleasure to meet so many great guides, writers and anglers. Come join us next year for a great adventure. This entry was posted in Fishing and tagged David Rose, Frabill, Ice-fishing, Mark Martin, Recycled Fish, SnoSuit, Walleye. Bookmark the permalink. Oh, man – TJ! I can’t believe you didn’t get to catch any – what a bummer. What a bummer! Oh, man, I’m so glad you got to try it out, but it’s WAY more fun when you catch ’em! A 300 fish day, even for a group of anglers, is a GREAT day. That’s an awesome photo of Mark. TJ, Thanks for all your help, can’t wait till we get you out the next time stay in touch Mark Martin. Thank you Mark. I appreciate the hospitality. No worries Teeg. The photos are more important than the fish. I’ll be on the water both days next year and get my shot at some ‘eyes. Thanks for the hand warmers and ice grippers. Sorry you were under the weather, and missed pulling the fish through the ice. Hey, you could have used those ice shoes in the parking lot here in Florida in early January. Sorry that you were under the weather while you were in Michigan. Glad to hear that the SnoSuit served you well while you were on the ice. Those suits are amazing! Thom, several of us were “husky” as I recall. 🙂 I enjoyed my trip up there so much and meeting everyone. I’ll follow up with Mark and see if I’m invited. Happy to hear the hooks are working on the ‘eyes. About the spill… Clean up continues. Life begins at bacteria, then plankton, then shrimp… HMS (Highly Migratory Species) like Tuna, split their stocks to breed, half of them go one way, the other the gulf. Will they breed in the gulf or will we lose a generation of Tuna? We won’t know how much damage there really is, for years. I sure have lost a lot of sleep over it.
? 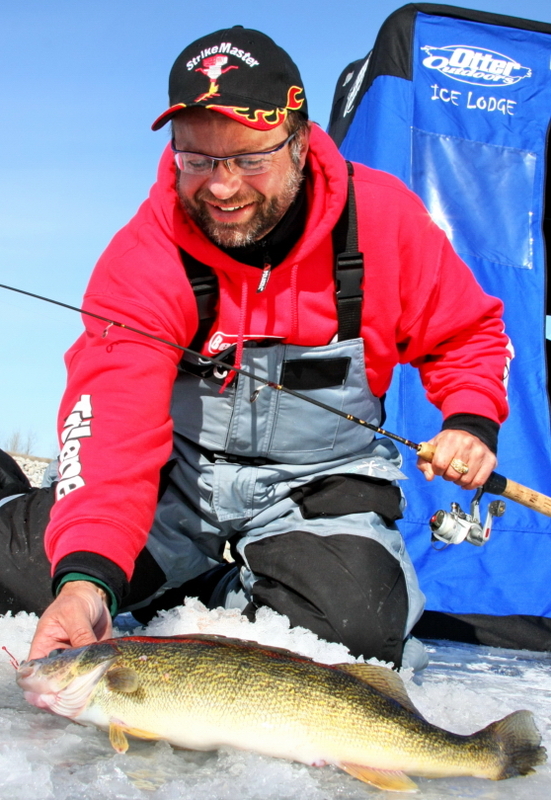 Can you fish with night crawlers using the dropShot method of fishing for walleye’s? And be successful? First year ice fishing, which way would u suggest on how to hook the night crawler ? I appreciate you helping out this 61 yr old rookie getting back into ice fishing. Is there any articles on ice fishing with night crawlers.? A lot on jigging and use of minnows. But haven’t seen any on the use of night crawlers. Thanks again. To help out this old newbie! Use night crawlers the dropShot method for ice fishing? Yep! On the ice too. You got that right on both statments TJ !!!!! !